Define the composition of an atom along with its electrons, neutrons, and protons. Explain the Pauli exclusion principle and its application to the atom. Specify the shell and subshell symbols and their positions. Define the position of electrons in different shells of an atom. State the position of each element in the periodic table according to shell filling. All atoms except hydrogen are multiple-electron atoms. The physical and chemical properties of elements are directly related to the number of electrons a neutral atom has. 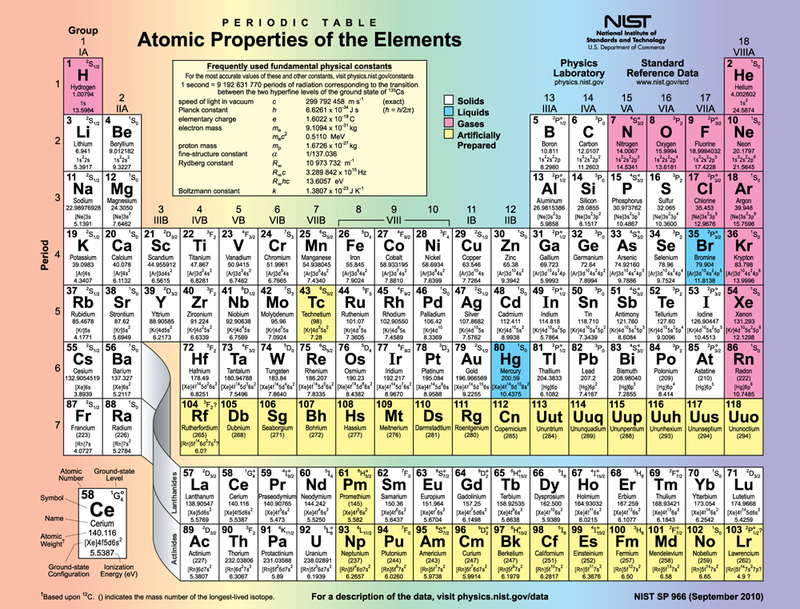 The periodic table of the elements groups elements with similar properties into columns. This systematic organization is related to the number of electrons in a neutral atom, called the atomic number, . We shall see in this section that the exclusion principle is key to the underlying explanations, and that it applies far beyond the realm of atomic physics. 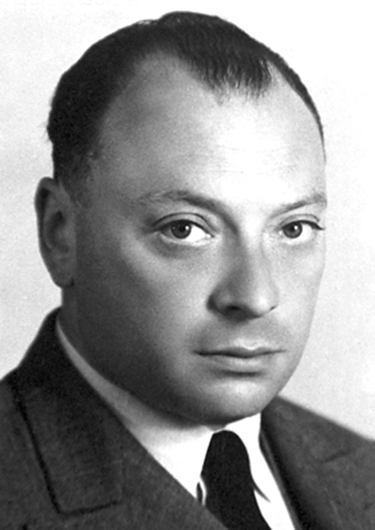 In 1925, the Austrian physicist Wolfgang Pauli (see [link]) proposed the following rule: No two electrons can have the same set of quantum numbers. That is, no two electrons can be in the same state. This statement is known as the Pauli exclusion principle, because it excludes electrons from being in the same state. The Pauli exclusion principle is extremely powerful and very broadly applicable. 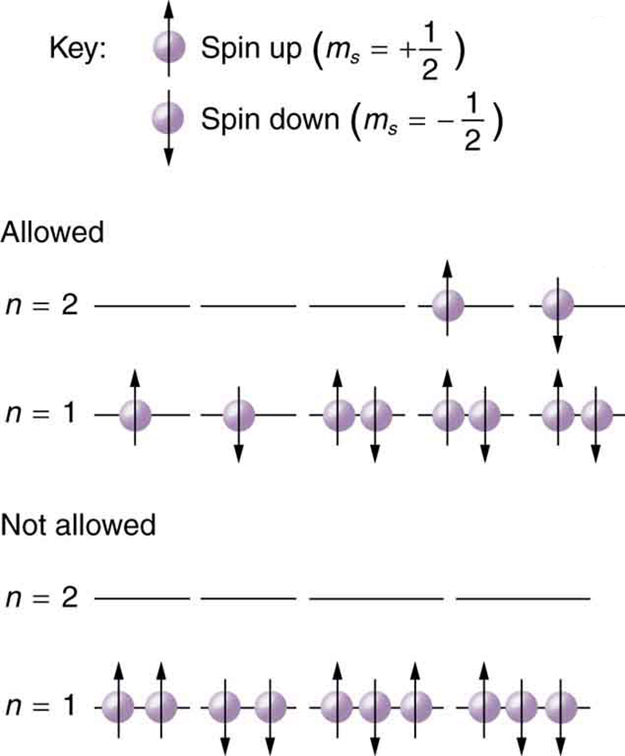 It applies to any identical particles with half-integral intrinsic spin—that is, having Thus no two electrons can have the same set of quantum numbers. No two electrons can have the same set of quantum numbers. That is, no two electrons can be in the same state. Let us examine how the exclusion principle applies to electrons in atoms. The quantum numbers involved were defined in Quantum Numbers and Rules as , and . Since is always for electrons, it is redundant to list , and so we omit it and specify the state of an electron by a set of four numbers . For example, the quantum numbers completely specify the state of an electron in an atom. Since no two electrons can have the same set of quantum numbers, there are limits to how many of them can be in the same energy state. Note that determines the energy state in the absence of a magnetic field. So we first choose , and then we see how many electrons can be in this energy state or energy level. Consider the level, for example. The only value can have is 0 (see [link] for a list of possible values once is known), and thus can only be 0. The spin projection can be either or , and so there can be two electrons in the state. One has quantum numbers , and the other has . [link] illustrates that there can be one or two electrons having , but not three. Because of the Pauli exclusion principle, only hydrogen and helium can have all of their electrons in the state. Lithium (see the periodic table) has three electrons, and so one must be in the level. This leads to the concept of shells and shell filling. As we progress up in the number of electrons, we go from hydrogen to helium, lithium, beryllium, boron, and so on, and we see that there are limits to the number of electrons for each value of . Higher values of the shell correspond to higher energies, and they can allow more electrons because of the various combinations of , and that are possible. Each value of the principal quantum number thus corresponds to an atomic shell into which a limited number of electrons can go. Shells and the number of electrons in them determine the physical and chemical properties of atoms, since it is the outermost electrons that interact most with anything outside the atom. The probability clouds of electrons with the lowest value of are closest to the nucleus and, thus, more tightly bound. Thus when shells fill, they start with , progress to , and so on. Each value of thus corresponds to a subshell. The table given below lists symbols traditionally used to denote shells and subshells. To denote shells and subshells, we write with a number for and a letter for . For example, an electron in the state must have , and it is denoted as a electron. Two electrons in the state is denoted as . Another example is an electron in the state with , written as . The case of three electrons with these quantum numbers is written . This notation, called spectroscopic notation, is generalized as shown in [link]. Counting the number of possible combinations of quantum numbers allowed by the exclusion principle, we can determine how many electrons it takes to fill each subshell and shell. How Many Electrons Can Be in This Shell? List all the possible sets of quantum numbers for the shell, and determine the number of electrons that can be in the shell and each of its subshells. Given for the shell, the rules for quantum numbers limit to be 0 or 1. The shell therefore has two subshells, labeled and . Since the lowest subshell fills first, we start with the subshell possibilities and then proceed with the subshell. It is convenient to list the possible quantum numbers in a table, as shown below. It is laborious to make a table like this every time we want to know how many electrons can be in a shell or subshell. There exist general rules that are easy to apply, as we shall now see. The number of electrons that can be in a subshell depends entirely on the value of . Once is known, there are a fixed number of values of , each of which can have two values for First, since goes from to l in steps of 1, there are possibilities. This number is multiplied by 2, since each electron can be spin up or spin down. Thus the maximum number of electrons that can be in a subshell is . For example, the subshell in [link] has a maximum of 2 electrons in it, since for this subshell. Similarly, the subshell has a maximum of 6 electrons, since . For a shell, the maximum number is the sum of what can fit in the subshells. Some algebra shows that the maximum number of electrons that can be in a shell is . For example, for the first shell , and so . We have already seen that only two electrons can be in the shell. Similarly, for the second shell, , and so . As found in [link], the total number of electrons in the shell is 8. How many subshells are in the shell? Identify each subshell, calculate the maximum number of electrons that will fit into each, and verify that the total is . 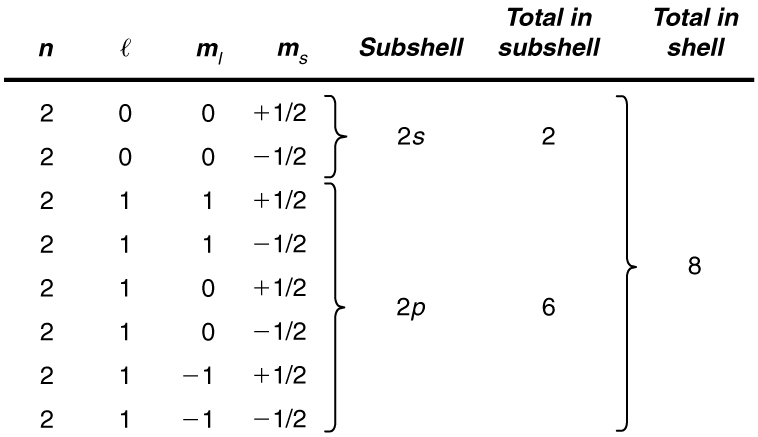 Subshells are determined by the value of ; thus, we first determine which values of are allowed, and then we apply the equation “maximum number of electrons that can be in a subshell ” to find the number of electrons in each subshell. The total number of electrons in the three possible subshells is thus the same as the formula . In standard (spectroscopic) notation, a filled shell is denoted as . Shells do not fill in a simple manner. Before the shell is completely filled, for example, we begin to find electrons in the shell. [link] shows electron configurations for the first 20 elements in the periodic table, starting with hydrogen and its single electron and ending with calcium. The Pauli exclusion principle determines the maximum number of electrons allowed in each shell and subshell. But the order in which the shells and subshells are filled is complicated because of the large numbers of interactions between electrons. Examining the above table, you can see that as the number of electrons in an atom increases from 1 in hydrogen to 2 in helium and so on, the lowest-energy shell gets filled first—that is, the shell fills first, and then the shell begins to fill. Within a shell, the subshells fill starting with the lowest , or with the subshell, then the , and so on, usually until all subshells are filled. The first exception to this occurs for potassium, where the subshell begins to fill before any electrons go into the subshell. The next exception is not shown in [link]; it occurs for rubidium, where the subshell starts to fill before the subshell. The reason for these exceptions is that electrons have probability clouds that penetrate closer to the nucleus and, thus, are more tightly bound (lower in energy). [link] shows the periodic table of the elements, through element 118. Of special interest are elements in the main groups, namely, those in the columns numbered 1, 2, 13, 14, 15, 16, 17, and 18. The number of electrons in the outermost subshell determines the atom’s chemical properties, since it is these electrons that are farthest from the nucleus and thus interact most with other atoms. If the outermost subshell can accept or give up an electron easily, then the atom will be highly reactive chemically. Each group in the periodic table is characterized by its outermost electron configuration. Perhaps the most familiar is Group 18 (Group VIII), the noble gases (helium, neon, argon, etc.). These gases are all characterized by a filled outer subshell that is particularly stable. This means that they have large ionization energies and do not readily give up an electron. Furthermore, if they were to accept an extra electron, it would be in a significantly higher level and thus loosely bound. Chemical reactions often involve sharing electrons. Noble gases can be forced into unstable chemical compounds only under high pressure and temperature. configuration) and are members of Group 1 (Group I). These elements easily give up their extra electron and are thus highly reactive chemically. As you might expect, they also tend to form singly positive ions, such as , by losing their loosely bound outermost electron. They are metals (conductors), because the loosely bound outer electron can move freely. Of course, other groups are also of interest. Carbon, silicon, and germanium, for example, have similar chemistries and are in Group 4 (Group IV). Carbon, in particular, is extraordinary in its ability to form many types of bonds and to be part of long chains, such as inorganic molecules. The large group of what are called transitional elements is characterized by the filling of the subshells and crossing of energy levels. Heavier groups, such as the lanthanide series, are more complex—their shells do not fill in simple order. But the groups recognized by chemists such as Mendeleev have an explanation in the substructure of atoms. The state of a system is completely described by a complete set of quantum numbers. This set is written as . The Pauli exclusion principle says that no two electrons can have the same set of quantum numbers; that is, no two electrons can be in the same state. This exclusion limits the number of electrons in atomic shells and subshells. Each value of corresponds to a shell, and each value of corresponds to a subshell. The maximum number of electrons that can be in a subshell is . The maximum number of electrons that can be in a shell is . Identify the shell, subshell, and number of electrons for the following: (a) . (b) . (c) . (d) . (a) How many electrons can be in the shell? (b) What are its subshells, and how many electrons can be in each? (a) 32. (b) and 14 in , for a total of 32. (a) What is the minimum value of 1 for a subshell that has 11 electrons in it? shell, what is the spectroscopic notation for this atom? (a) If one subshell of an atom has 9 electrons in it, what is the minimum value of ? (b) What is the spectroscopic notation for this atom, if this subshell is part of the shell? (a) List all possible sets of quantum numbers for the shell, and determine the number of electrons that can be in the shell and each of its subshells. (b) Show that the number of electrons in the shell equals and that the number in each subshell is .
. State which rule is violated for each that is not allowed. (a) Using the Pauli exclusion principle and the rules relating the allowed values of the quantum numbers , prove that the maximum number of electrons in a subshell is . (b) In a similar manner, prove that the maximum number of electrons in a shell is 2n2. (a) The number of different values of is for each and one for Also an overall factor of 2 since each can have equal to either or . to see that the expression in the box is imagine taking from the last term and adding it to first term Now take from penultimate term and add to the second term . Estimate the density of a nucleus by calculating the density of a proton, taking it to be a sphere 1.2 fm in diameter. Compare your result with the value estimated in this chapter. The electric and magnetic forces on an electron in the CRT in [link] are supposed to be in opposite directions. Verify this by determining the direction of each force for the situation shown. Explain how you obtain the directions (that is, identify the rules used). The electric force on the electron is up (toward the positively charged plate). The magnetic force is down (by the RHR). (a) What is the distance between the slits of a diffraction grating that produces a first-order maximum for the first Balmer line at an angle of ? (b) At what angle will the fourth line of the Balmer series appear in first order? (c) At what angle will the second-order maximum be for the first line?
. What wavelength do we observe for an to transition for hydrogen in that galaxy? Calculate the velocity of a star moving relative to the earth if you observe a wavelength of 91.0 nm for ionized hydrogen capturing an electron directly into the lowest orbital (that is, a to , or a Lyman series transition). In a Millikan oil-drop experiment using a setup like that in [link], a 500-V potential difference is applied to plates separated by 2.50 cm. (a) What is the mass of an oil drop having two extra electrons that is suspended motionless by the field between the plates? (b) What is the diameter of the drop, assuming it is a sphere with the density of olive oil? What double-slit separation would produce a first-order maximum at for 25.0-keV x rays? The small answer indicates that the wave character of x rays is best determined by having them interact with very small objects such as atoms and molecules. In a laboratory experiment designed to duplicate Thomson’s determination of , a beam of electrons having a velocity of enters a magnetic field. The beam moves perpendicular to the field in a path having a 6.80-cm radius of curvature. Determine from these observations, and compare the result with the known value. Find the value of , the orbital angular momentum quantum number, for the moon around the earth. The extremely large value obtained implies that it is impossible to tell the difference between adjacent quantized orbits for macroscopic objects. Particles called muons exist in cosmic rays and can be created in particle accelerators. Muons are very similar to electrons, having the same charge and spin, but they have a mass 207 times greater. When muons are captured by an atom, they orbit just like an electron but with a smaller radius, since the mass in is 207 . (a) Calculate the radius of the orbit for a muon in a uranium ion ( ). (b) Compare this with the 7.5-fm radius of a uranium nucleus. Note that since the muon orbits inside the electron, it falls into a hydrogen-like orbit. Since your answer is less than the radius of the nucleus, you can see that the photons emitted as the muon falls into its lowest orbit can give information about the nucleus. (b) 0.37 of the nuclear radius.
. In 1.00 ms, this laser raised the temperature of of flesh to and evaporated it. (a) How many photons were required? You may assume flesh has the same heat of vaporization as water. (b) What was the minimum power output during the flash? Suppose an MRI scanner uses 100-MHz radio waves. (a) Calculate the photon energy. (b) How does this compare to typical molecular binding energies? (a) An excimer laser used for vision correction emits 193-nm UV. Calculate the photon energy in eV. (b) These photons are used to evaporate corneal tissue, which is very similar to water in its properties. Calculate the amount of energy needed per molecule of water to make the phase change from liquid to gas. That is, divide the heat of vaporization in kJ/kg by the number of water molecules in a kilogram. (c) Convert this to eV and compare to the photon energy. Discuss the implications. (c) 0.454 eV, 14.1 times less than a single UV photon. Therefore, each photon will evaporate approximately 14 molecules of tissue. This gives the surgeon a rather precise method of removing corneal tissue from the surface of the eye. Prove that the velocity of charged particles moving along a straight path through perpendicular electric and magnetic fields is . Thus crossed electric and magnetic fields can be used as a velocity selector independent of the charge and mass of the particle involved. (a) What voltage must be applied to an X-ray tube to obtain 0.0100-fm-wavelength X-rays for use in exploring the details of nuclei? (b) What is unreasonable about this result? (c) Which assumptions are unreasonable or inconsistent? (b) The voltage is extremely large compared with any practical value. (c) The assumption of such a short wavelength by this method is unreasonable. A student in a physics laboratory observes a hydrogen spectrum with a diffraction grating for the purpose of measuring the wavelengths of the emitted radiation. In the spectrum, she observes a yellow line and finds its wavelength to be 589 nm. (a) Assuming this is part of the Balmer series, determine , the principal quantum number of the initial state. (b) What is unreasonable about this result? (c) Which assumptions are unreasonable or inconsistent? The solar corona is so hot that most atoms in it are ionized. Consider a hydrogen-like atom in the corona that has only a single electron. Construct a problem in which you calculate selected spectral energies and wavelengths of the Lyman, Balmer, or other series of this atom that could be used to identify its presence in a very hot gas. You will need to choose the atomic number of the atom, identify the element, and choose which spectral lines to consider. Consider the Doppler-shifted hydrogen spectrum received from a rapidly receding galaxy. Construct a problem in which you calculate the energies of selected spectral lines in the Balmer series and examine whether they can be described with a formula like that in the equation , but with a different constant . 1 It is unusual to deal with subshells having greater than 6, but when encountered, they continue to be labeled in alphabetical order. The Pauli Exclusion Principle by OpenStaxCollege is licensed under a Creative Commons Attribution 4.0 International License, except where otherwise noted.